Study Finds 5,000 People May Have Died From Hurricane Maria in Puerto Rico. Cable News Focused on Roseanne Instead. Cable news covered Roseanne for over 10 hours. They covered Hurricane Maria's death toll in Puerto Rico for just over 30 minutes. On Tuesday, Harvard researchers published a study estimating that approximately 5,000 deaths can be linked to Hurricane Maria in Puerto Rico. 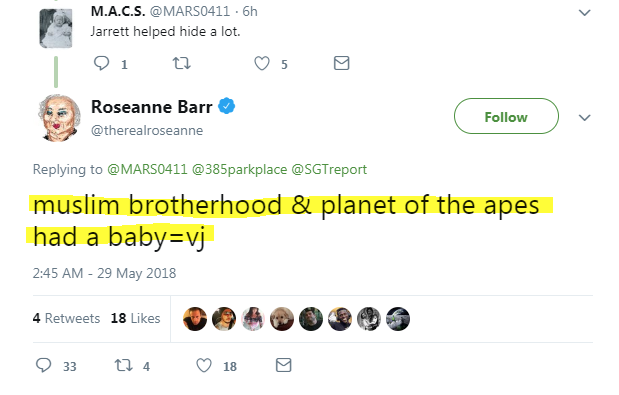 The same day, ABC canceled Roseanne Barr’s eponymous show Roseanne after Barr sent a racist tweet about Valerie Jarrett, an adviser to former President Barack Obama. 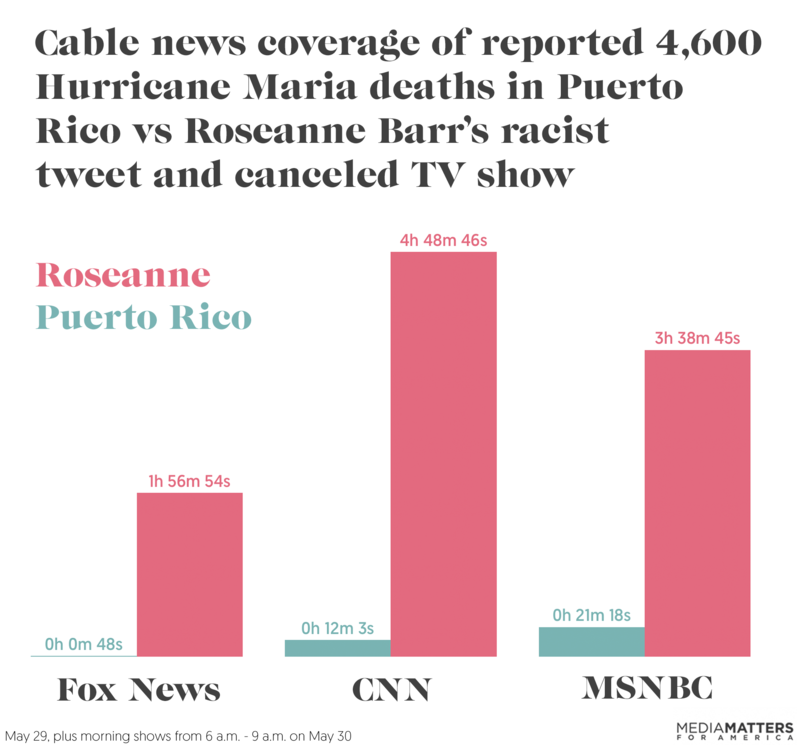 Cable news covered Barr’s tweet and her show’s cancellation 16 times as much as the deaths of U.S. citizens in Puerto Rico. While the official death toll remains at just 64, the Harvard study, written up in The Washington Post, “indicated that the mortality rate was 14.3 deaths per 1,000 residents from Sept. 20 through Dec. 31, 2017, a 62 percent increase in the mortality rate compared with 2016, or 4,645 ‘excess deaths.’” BuzzFeed News, which also reported on the study, further explained that the researchers adjusted their estimate up to 5,740 hurricane-related deaths to account for “people who lived alone and died as a result of the storm” and were thus not reported in the study’s survey. Cable news barely covered the report. The May 29 broadcasts of MSNBC combined with the network's flagship morning show the next day spent 21 minutes discussing the findings. CNN followed with just under 10 minutes of coverage, and Fox covered the report for just 48 seconds. By contrast, cable news spent over 8 and a half hours discussing a tweet from Barr describing Jarrett, a Black woman, as the offspring of the Muslim Brotherhood and Planet of the Apes and the subsequent cancellation of her show.  Media coverage of the crisis in Puerto Rico has been dismal since the hurricane hit; even when outlets reported on major scandals about the mismanaged recovery, the coverage was negligible and faded quickly.